A study that was recently done asking women what their number one complaint was after leaving the salon, the answer not to my surprise after you really think about it was that their hair never looks as good as it does when we, the stylist does it. What some clients don’t really understand is without the proper products and tools you can’t recreate that look in the slightest bit! If you want your hair to look exactly the way it does when you leave your stylist then you should use exactly what she’s using in your hair. I can’t stress enough as a hairdresser, suave and herbal Essences is doing absolutely nothing for you..and is honestly such a no,no. The old saying rings true for this as it does everything else, “YA GET WHAT YA PAY FOR”. Girls, if your spending hundreds every year on getting that perfect color or cut, doesn’t it only make sense to preserve that color, cut and integrity of your hair!! I’ll never forget some one I assisted under used to say “think of it as your hair wardrobe” it makes sense, you definitely don’t need to buy everything at once, stop by when you get a little extra to spend on something for yourself or plan for your next appointment maybe ill skip a cut and buy the deep conditioner instead because I know that’s going to benefit my hair in the long run. Make it a point to buy one product every other time and before you know it your bathroom or vanity will be stocked with all the tools you need to recreate your look! Working at H2O we carry two lines, Paul Mitchell and kárastasé. These two lines both have there reasons why we love them but they have one big difference and that my friends, would be, the price point. I’ll be honest, Paul Mitchell is fab but any kárastesé girl will tell you, once you use it.. NOTHING COMPARES. This is literally the most amazing mouse in the world, (L.I.T.E.R.A.L.L.Y) I’m obsessed. 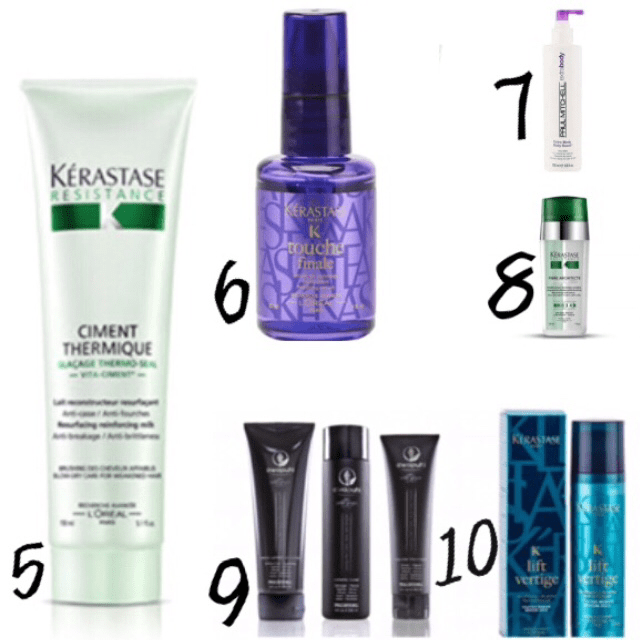 It gives your hair incredible texture and adds body without weighing it down. I hate when I just wash my hair because it will do NOTHING, put a handful of this stuff in and I’m set! This oil is for all hair types, and is so great because it can be used both pre and post styling. It helps to protect, strengthen and smooth the hair. It’s so conditioning and makes the hair feel super soft! (Not to mention it doubles as a way to make your legs look amazzzzinggggg on a night out) …. 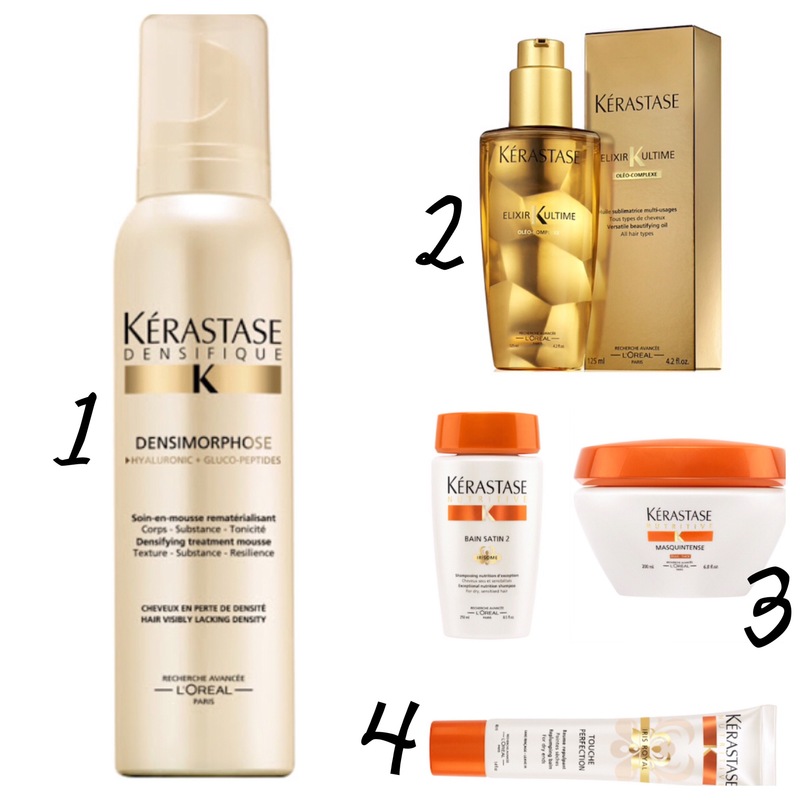 Number three is a all time kèrastase Classic for all types of hair. This line makes it easy on everyone as they offer Bain satin 1,2, & 3 along with a masque for thick or thin hair. My newest go to! Lately my hair has been in this awful dry spell, (you should see my lap from all the breakage when I brush my hair, scary people!) I’ve been using this daily and am totally seeing a change! This is a On-the-Go Nourishment for Dry Ends! It’s perfect to throw in your purse and immediately gives your hair the moisture it needs when it’s dry! Leave in conditioner for those with breakage! Basically, all my blonde sistas need this! It’s strengthens the hair and helps prevent damage while smoothing cracks and split ends! A must for all of us Louisiana girls, as this product is a anti-humectant offering a frizz free, polishing affect with amazzzingg shine! Pop a little in as a finisher before curling/straightening or just throughout the day when your needing a little boost! One of my classic go to’s with Paul Mitchell, the name says basically all you need to know! The key ingredient here is Panthenol which actually swells the hair strand at the root! Another one of my every day go to’s, #blondelife, unfortunately I need all the help I can get… This product is great for those with breakage who are trying to strengthen their hair. It’s a heat protectant and only heat activated. My favorite shampoo, conditioner, and treatment that Paul Mitchell makes. It’s sulfate free, color-safe, and helps moisturizer and rebuild while adding tons of shine! Okay so of course I’ll have two root boots on here, I meannnnn, you can never have enough in my opinion! Kerastase lift VERTIGE is a gel-texture that lifts the roots and adds volume! It gives crazy texture and it’s the perfect texture for teasing on those with fine hair! Awesome Blog post!! Great info luv ya! !